Mexicans love a good fiesta and we also sure love to eat—fortunately, the two are never mutually exclusive. Día De Los Muertos (Day Of The Dead) is one such food-filled Mexican holiday that has gone through its fair of changes; what was previously a celebration held at the beginning of summer is now a three-day affair in autumn. It went from a foreign holiday to the central theme of an Academy Award-winning Pixar movie—and once something is mentioned in the same breath as Disney, it’s officially a mainstream holiday. Regardless of the changes in dates and popularity that Día De Los Muertos has gone through, a common thread remains: Food. Part of the Mexican observance of Día De Los Muertos are the brightly colored, ornate altars set up by living family members as an offering to the souls of the deceased. The belief is that on this holiday, the souls of our loved ones make their way back home for a period of time. These altars feature as their centerpiece a photograph of the person to whom the altar is dedicated, surrounded by various gifts, fruits, candles as well as candies for the souls of the children and tequila for the souls of the adults. (These souls are hungry and I doubt there are Michelin-rated restaurants in the afterlife, so homemade food is another important altar component.) Of the most common food items presented, tamales are the favorite: sweet tamales for the child souls, and spicy for the adult souls. But in Mexico, tamales aren’t relegated to Día De Los Muertos; they’re staples at various festivities and holidays alike. If you’ve never had a tamale, here’s me shoving you into a delicious world that I’m not so secretly judging you for being unfamiliar with. 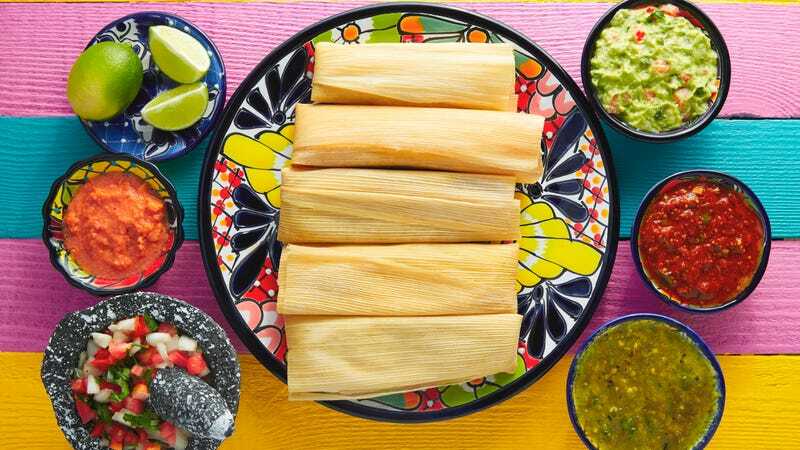 In their most basic form, tamales are a traditional Latin-American dish made of a corn dough body surrounding a variety of fillings such as meats, cheeses, fruits, or vegetables, then wrapped in corn husk or banana leaf and steamed. The wrapping is usually discarded, because eating a tamale wrapper can potentially cost you a presidential term. Tamales have a history that dates back thousands of years; it’s believed that tamales were made as early as 7,000 B.C., before corn had even been domesticated. At this point, tamales were considered sacred and used as ritual food offerings to various gods. Tamales as we know them now derive from Mexican and Guatemalan cultures closer to 100 A.D., where they were humble, portable food, ideal for packing up for long journeys and hunting trips. Tamales are synonymous with Mexican and Central American cuisine, but iterations of this dish exist in various other countries, from South American cultures to those in the Caribbean and as far away as the Philippines. The corn body is the common trait amongst the many variations, as are the corn husks or banana leaf wrappings. Tamales also seem to be a dish commonly cooked for special occasions, particularly Christmas in various other countries. It’s the subtle nuances, the varying native spices, sauces, and other ingredients that make tamales unique to each country. In its current form, the Chicago tamale is still its own unique variation. Unlike other tamales, the Chicago tamale is wrapped in paper, isn’t saved for special occasions other than celebrating leaving the bar drunk at 3 a.m. There are endless ingredients and fillings for tamales; they truly serve as a blank canvas for chefs and home cooks alike. Some common ingredients you’ll find in tamales are shredded chicken, pork, cheese, and beans, but there are also sweet versions of tamales served as a dessert. The ancient Aztecs, seemingly taking a page out of some prehistoric hipster cookbook, used flamingo, salamander, and frog to fill their tamales. You now have creative minds like Claudia Sandoval making delicious tamale recipes with corn fungus (huitlacoche) as an ingredient. There are no rules, thankfully. Whatever your flavor is, chances are there is a tamale out there for you. If you’re looking for vegan tamales, come try my sister’s batch at our family Christmas (just make sure you bring some beer to share). If it’s 2 a.m., you’ve had too many cold Hamms’, and you find yourself in Chicago, look for Claudio the tamale guy efficiently slinging his goods at bars; he cooks his tamales daily and they’re always warm, ready to eat. The point is to get out there and get to know tamales the easiest way possible—by eating them.